The lushly planted exterior offers a serene and soothing welcome as you approach. The sign at the entrance that reads "esthetic dentistry" takes on an even richer significance once you enter. The office both interesting and inviting, and its thoughtful design enhances the feeling of spaciousness. Beautiful art from the Orient, which Dr. Taylor has collected during his global travels, contributes to a quiet, elegant atmosphere. It is clear that beauty, balance and harmony have been considered in every choice. Most dentistry today is "esthetic" in the sense that dentists routinely use materials and procedures designed with appearance in mind. In Dr. Taylor's practice, however, the term takes on greater emphasis, backed by an arsenal of technology and scientific advancements. As an instructor at the Las Vegas Institute for Advanced Dental Studies, he teaches other dentists from around the country about a new way of designing a treatment plan based upon more complete and accurate objective information, using an approach known as neuromuscular dentistry. Neuromuscular dentistry expands on traditional dentistry by looking at three essential factors: occlusion, or how the upper and lower teeth fir together; the activity of the facial muscles; and the action of temporomandibular joint. These factors are examined using painless, non-invasive tests done with special computerized equipment. A computerized mandibular scan (CMS) is conducted by attaching tiny magnets to the lower gum. The sensor-equipped CMS headgear then tracks the patterns of jaw movement during opening and closing. Muscle activity is monitored with surface electromyography (SEMG), which detects signals created by the muscles and sends them back to a computer via thin wires attached to the skin with adhesive patches. Electrosonography (ESG) allows the dentist to study the sounds made by the jaw joints. It involves the use of a walkman-like headset with sound sensors positioned over each jaw joint. This extensive data gathering helps Dr. Taylor to restore the patient back to the most optimal position for comfort and to minimize destructive forces that could continue to damage teeth and joints. Rather than correcting individual problems with individual teeth, Dr. Taylor used this objective information to dispense with guesswork and designed an individualized plan for restoration that precisely suited Bonnie's facial anatomy. He also incorporated what is known about the esthetics of facial proportion to help correct the vertical height of Bonnie's teeth while achieving a relaxed resting position for her jaw and perfecting its trajectory during movement. First, Dr. Taylor created an orthotic which would allow him to "test" the data he obtained before proceeding with restoration. After three months, Bonnie reported that her orthotic was comfortable - tests showed no additional destruction and her jaw muscles were much more relaxed in their resting position. Her restoration was completed in a single day, and the results dramatic and immediate. "I can't believe I waited so long to do this for myself. And I'm so happy with my new look. One friend even asked me if I'd had a facelift!" Indeed, once the youthful proportions of her lower face were restored, Bonnie looked years younger. 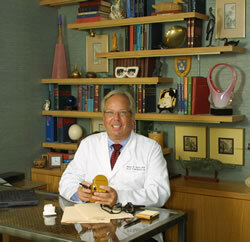 Dr. Taylor takes advantage of neuromuscular techniques in all of his routine dental treatments, not just full-mouth reconstructions. He finds it to be especially helpful for patients who require dentures or have implants to improve function and reduce destructive forces, and he appreciates the objectivity of the data the testing provides. "It has been said that if it can be measured, it's fact. If it can't, it's opinion." There is no doubt about his sincerity or dedication. "I believe so strongly in the benefits of neuromuscular dentistry that I have had it performed on myself," he adds, and quickly produces his own before and after photos for review. Contact our office if you would like more information about Dr. Taylor or the procedures we perform.